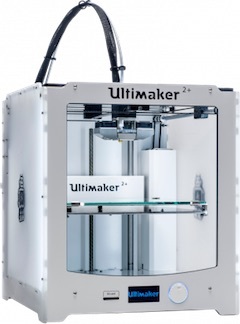 The Ultimaker 3D printer is an FDM (Fused Deposition Modeling) printer, which creates 3 Dimensional objects though the successive accumulation of thin layers. Of the Maker Hub's family of 3D printers, the Ultimaker tends to create the smoothest, best-looking prints, at the expense of being the slowest. Another downside to this printer is that it uses a different filament size from our other printers, so there is less variety of materials available. The Ultimaker has interchangable extruders, so you can experiment with nozzle diameters as small as .25mm for high-resolution prints, or as large as .8mm for faster jobs.